There’s a vault of tracks that didn’t make new album Humanz. Gorillaz's new album Humanz has a tracklist that reads like a festival line-up already. The animated group's upcoming record features guests Danny Brown, Kelela, Vince Staples, Popcaan, Mavis Staples, Pusha T, Grace Jones, D.R.A.M., and many more across its 19 song running order. 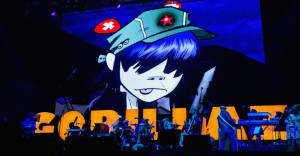 However, there's much more material where that came from, according to band leader Damon Albarn. Speaking to Zane Lowe during a Beats 1 interview that will be broadcast in full later today, April 6, Albarn revealed that he's sitting on "40, 45" more songs recorded during the Humanz sessions. “I’m just sort of slowly going through all tunes that sort of didn’t work out and finishing them,” he said. Albarn added that he'd just finished a "really exciting" one featuring Little Simz before joking that the leftover songs will help him “stay in the game for at least another 18 months, I reckon." The group recently announced that they would be headlining their own U.K. festival in Margate, Kent this June. Humanz is out on April 28.